Over the past decade the use of stem cells has opened up a new frontier in clinical treatment. With their capacity to differentiate into multiple lineages of somatic cells, stem cells can be potentially used to regenerate or replace damaged cells / tissues. This offers huge potential in treating degenerative diseases such as Parkinson's disease  or repairing injured tissue such as in spinal cord repair , areas where traditional pharmacology and medical treatments has yet to be able to help to any great extent . More and more stem cell therapies are being devised and entering trials: the public EU clinical trials database (https://www.clinicaltrialsregister.eu/index.html) lists over 400 studies currently in stages II-IV clinical trials, and globally the number of studies runs into the thousands . The increasing sophistication of stem cell therapies calls for more accurate tracking methods both to determine their destinations and final differentiated fates. One area of particular importance in the field of stem cell tracking is the use of nanoparticles in MRI. This is one of the more successful and widespread methods used in cell tracking as the nanoparticles give a strong signal, allowing a good visualisation of the cells. Additionally the labelling of cells with the nanoparticles is relatively straightforward and the scanning can be done in vivo in a non-invasive manner. This review will therefore focus on this exciting and growing aspect of stem cell research. Depending on their source of origin, stem cells have the ability to diversify into many other types of cells: hematopoietic stem cells for example, give rise to the versatile progenitor, precursor and terminally differentiated blood cells; whereas embryonic stem cells have the pluripotency to differentiate into any type of somatic cell. While many stem cell therapies are under development there are currently few treatments that have completed clinical trials and entered clinical practice, and the earliest and so far the most successful stem cell therapy is bone marrow replacement. The bone marrow contains hematopoietic stem cells which act as a source of many types of blood cells, including myeloid and lymphoid lineages of cells. Cancers of the bone marrow such as leukaemia are treated by irradiating or otherwise destroying the cancerous cells; as the treatment is not specifically cell type targeted this also kills healthy bone marrow. To allow the patient to continue making replacement blood cells a suitably matched bone marrow donor is needed to contribute healthy hematopoietic stem cells to the patient . The first trial into bone marrow replacement therapies were carried out in the 1950s  and today the procedure is routine in hospitals around the world. More recently regulatory bodies such as the FDA are beginning to authorise the use in the clinic of a number of new stem cell therapies, although these are mostly all in the use of hematopoietic stem cells. The New York Blood Center markets Hemacord  for use in hematopoietic stem cell replacement with the source of the stem cells being umbilical cord blood rather than bone marrow; several other institutions such as Clinimmune Labs at the University of Chicago also offer similar stem cell therapies from this source (http://www.fda.gov/BiologicsBloodVaccines/CellularGeneTherapyProducts/ApprovedProducts/ucm305600.htm). These therapies are not targeted, however; they rely on using large numbers of stem cells with the assumption that enough cells will find their own way to their targets to create a viable population. Clinimune's cord blood therapy, for example, requires a minimum dose of 2.5 × 107 cells per kg of the patient's weight. While this approach works well for hematopoietic stem cell replacement - as a large number of cells need to be replaced at a number of sites - other stem cell therapies are not amenable to this unsubtle approach. In spinal cord injury repair, for example, the introduction of replacement neural stem cells / neurons must be carefully targeted as there is a limited volume in both the spinal cord tissue and between the damaged spinal cord and the spinal column. In some cases the stem cells, should they migrate to the wrong destination in the body, may give rise to complications. Stem cells resemble cancer cells in certain ways, such as being able to go through unlimited cell division and possessing high telomerase activity, and stem cells in the wrong place can indeed become cancerous or form teratomers or ectopic tissues   . Additionally stem cells that are hard to harvest, produce or maintain (such as embryonic stem cells) cannot be acquired in very large numbers easily . Stem cell tracking in animal models has also revealed that the cells do not necessarily need to end up at the site of damage to be effective. In central nervous system damage and degenerative diseases, neurotrophic factors such as nerve growth factor (NGF) and brain-derived neurotrophic factor play essential roles in the therapy of neurological disorders . These compounds promote both the growth and survival of neurons, and endogenous stem / progenitor cells to be activated into neuronal differentiation for potential structural re-connections and functional recovery. Therefore stem cells which produce neurotrophic factors do not necessarily need to be applied directly to the site of damage, they only need to be close enough for the neurotrophic factors to have an effect on the endogenous cells , promoting re-growth and repair. For example, studies into motor neurone disease in mouse models indicates that injected stem cells can exert positive effects away from the affected tissue   in such a way. This information allows subsequent therapies to be administered in less invasive ways. Stem cell tracking also allows a more detailed picture of the mechanisms involved in the therapies to be determined. Examples where tracking has been used to gain insights into therapeutic mechanisms include a model of renal failure in rats to determine the distribution and renal protection capability of a mesenchymal stem cell therapy , and in an investigation into the migration and ability to re-myelinate neurons by oligodendrocytes in a model of multiple sclerosis . Stem cell tracking therefore allows therapies which ensure stem cells can be administered at a site where they can give the maximum therapeutic benefit for the minimum amount of cells whilst minimising the potential for harm, and a large number of stem cell tracking methods are being developed to achieve this. Often in the past the only ways to discover the destinations and fates of stem cells used in various therapies consisted of invasive procedures, such as biopsies of the tissues where the cells were expected to be localised . This is not ideal in a laboratory setting where such invasive techniques may interfere with the effect the stem cells have been introduced to produce, nor is it good in any eventual clinical applications where it will cause additional pain and damage to the patient. Therefore recent efforts in stem cell tracking have been focusing on methods that are effective as well as non-invasive (Figure 1). For decades, fluorescent markers have been one of the most readily visualised signals to be used in cell tracking. They have been used in a number of studies to track stem cell movement and differentiation due to their strong signals   . If the marker can be incorporated into the genome of the stem cell, such as gene of a fluorescent protein like mCherry , the expression would be continuous (depending on the promoter) meaning the signal will not be diminished even after many rounds of division, as would be the case with a finite marker added to the cells. Unfortunately fluorescent markers are rather difficult to detect in vivo as the excitation and/or emission signals may not be able to penetrate the body to or from the depth where the stem cells are located. Methods such as multi-photon imaging are being used to overcome this. Here two long wavelength laser beams are used to cause fluorescence- both beams must hit the fluorophore to cause fluorescence (thus “multi-photon”). As the two beams are focused in one plane this cuts down the background fluorescence in other planes in the z axis, meaning higher resolution images can be taken deeper in a sample , although there are still limits to the depth of penetration. Stimulated emission depletion (STED) microscopy is another dual-laser method of taking fluorescence deeper into tissue. Here the apparatus is able to interfere with the way the excited electrons in fluorophores outside of the focal plane return to the ground state, red-shifting their photon emissions. This difference in emission wavelengths means the background fluorescence can be factored out of the final image, allowing imaging deeper into tissue. Again there are limitations as this method can not be used to penetrate deep into all tissues. For example in an experiment looking into investigating neuron activity in a living mouse brain part of the skull needed to be removed for the light to enter the brain . Many techniques which utilise fluorescent signals require the removal of tissue samples from the host in order to investigate the final results of the process. However, genetic manipulation can also be used to introduce genes for other types of proteins such as those which can be detected on a PET scan . Summary of some of the methods currently used to track stem cells. Clockwise from top left: Fluorescence tracking of human embryonic stem cells expressing the protein mCherry ; STED imaging of neurons in the brain of a live mouse, and the top of the cranium has been removed in order for the light to penetrate into the brain ; PET scan of a mouse injected with embryonic stem cells containing a PET reporter gene coding for truncated thymidine kinase ; MRI image of neural stem cells- left image is unlabelled, right image contains cells labelled with magnetic nanoparticles ; Radio-labelled stem cells injected into spinal cord imaged using scintography (left) and x-ray (right) . Radio-labelled tracking is similar to fluorescence tracking in that the signal can be strong and relatively easily detected. It also offers the advantage that radio-labelled cells can be detected while within the body, making in vivo tracking much simpler . However the signal will diminish over time as cells divide and the radio-labelled components get metabolised. Another disadvantage is the radioactive nature of the labels themselves, which may damage the DNA of the cells. Radio-labelling can be performed on a diverse range of targets, including nucleotides, cell surface receptors and antibodies raised against targets on the stem cells. There are also a number of scanning techniques which can be used to track stem cells if the appropriate contrast agent is incorporated into them. X-ray computed tomography , PET scans  and MRI scans  have all been used to investigate stem cell migration in a non-invasive way in vivo. Scanning with these methods has the advantage of being non-invasive while also giving a strong signal. One of the most widely used types of contrast agent currently being used to track stem cells in MRI are nanoparticles, the remainder of this review will look at nanoparticles in more detail. The term nanoparticle covers a diverse range of chemical composition with an equally diverse number of uses and are typically defined as having at least one dimension on the nanometer scale (1-100nm) . Medical science is benefitting from the use of nanoparticles. Because of their high electron density, colloidal gold particles are commonly used as tracers in electron microscopic studies of cellular biological samples [28-33]. Gold nanoparticles are red in colour because of the Mie absorption by their surface-plasmon oscillation that peaks at 520 nm . The aggregation of gold nanoparticles leads to the formation of a new absorption band at longer wavelengths as a result of electric dipole-dipole interaction and coupling between the plasmons of neighbouring particles in the formed aggregates. Nanoparticle aggregates with interparticle distances substantially greater than the average particle diameter appear red, but as the interparticle distance in these aggregates decreases to less than approximately the average particle diameter, the colour of the aggregates turns blue [35, 36]. Nanoparticles with magnetic properties are very widely used in MRI techniques as they interact with neighbouring protons in water molecules when a magnetic field is applied. This change of behaviour can be detected using an MRI scanner and shows up as a hypointensive area in an MRI image. Paramagnetic materials react to a magnetic field due to unpaired electrons aligning with the field, giving the material magnetic properties. In superparamagnetic materials it is not individual atoms that are affected- these nanoparticles are made up of small crystals of around 1-10 nm in length, and in a magnetic field it is the magnetic moment of the whole crystal aligning with the field that gives the material magnetic properties [37, 38]. Magnetic nanoparticles are widely used in tracking stem cells by MRI both in vitro and in vivo but are not limited to just stem cells, they can also be applied in other tracking settings. Magnetic nanoparticles are being used as diagnostic tools in an array of diseases. In tuberculosis (TB) for example, super-paramagnetic iron nanoparticles are being used to detect tuberculosis bacteria. Here the nanoparticles are conjugated to anti-tuberculosis antibodies and administered to the subject. The antibodies bind to the bacteria and the nanoparticles act as a contrast agent in an MRI scan, allowing the infected areas to be imaged . In cancer diagnosis nanoparticles are acting as contrast agents and have been used in studies of pancreatic cancer, again being conjugated to antibodies specific to cancer cell markers . Gene therapy has also seen a need for tracking the vectors used to deliver genetic information. Adenoviruses have been extensively used as vectors in gene therapy studies, and their ability to penetrate various tissues to reach their targets needs to be understood. In one in vivo study, for example, an adenovirus conjugated with iron oxide nanoparticles and tracked by MRI to ascertain how well it penetrated through the brain to reach a glioma in order to deliver genetic material to re-constitute the tumour suppressing protein p53 . This diverse range of studies attests to magnetic nanoparticles being a most useful method of tracking a target, whether it's an invading bacterium, a therapeutic vector, or indeed a stem cell. Of all the current methods of tracking stem cells in vivo the use of magnetic nanoparticles in MRI is the most promising. Many hospitals already have MRI scanners, making the translation of successful therapies into the clinic relatively straightforward. An MRI scan also gives a high-resolution 3D image, making the tracking of stem cells relatively straightforward regardless of where in the body the stem cells are located. MRI is a non-invasive method which minimises the patient's discomfort, in contrast with the traditional techniques of monitoring stem cells which are often invasive, including biopsying the site of treatment and even in some cases the need to sacrifice an animal test subject to collect the data. Other methods such as modified stem cells expressing fluorescent proteins offer immediate visual signals as to the stem cell location but this is hard to translate in vivo. Similarly methods such as radio-labelling may do more harm than good. 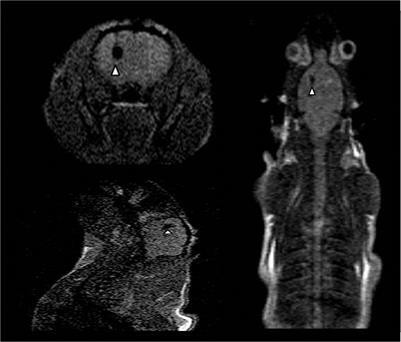 Genetic modification of cells to cause them to produce PET scanning contrast agents also gives a strong signal but genetic manipulation may not be a suitable technique if using the patient's own stem cells in treatment. Feridex is a magnetic iron oxide nanoparticle contrast agent. It was manufactured by AMAG Pharmaceuticals originally for use in imaging the liver (Figure 2) and was approved by the FDA for use in patients [38, 42]. Even though it has subsequently been discontinued it was used in a number of stem cell tracking studies, an “off-label” use which nevertheless has been widely used. Since it had already been given approval for use in humans it was an ideal starting point for nanoparticle MRI tracking of stem cells. Feridex as contrast agent in the liver. Feridex magnetic iron oxide nanoparticles injected into the liver are taken up by healthy liver cells. Healthy cells will therefore give a hypointense signal (area indicated by arrows) while any abnormality such as a tumour is unable to take in the nanoparticles, and will show up as a hyperintense area . In addition to Ferridex there are also other, non-clinical grade types of iron oxide nanoparticles commonly used in MRI stem cell tracking, and newer nanoparticles are also being investigated to improve on the features of iron oxide nanoparticles. Cobalt-based nanoparticles, for example, give a stronger response to a magnetic field, making their detection easier. There are a number of different methods for getting the nanoparticles into cells. By far the easiest is simple incubation with the nanoparticles being added to the culture medium, but this ease of use is countered by the fact that the uptake can be quite low and may not suitable for all cell types. Electroporation  or ultrasound  can be used to disrupt the cell membrane, allowing the nanoparticles to enter, although this has the danger of permanently damaging the cells. Other methods involve using poly-cationic transfer agents; compounds such as poly-L-lysine are used to coat the negatively-charged nanoparticles, allowing easier binding to the anionic cell membrane [38, 45]. Whatever the method of entry shall be, additional experiments need to be carried out to ensure that the presence of nanoparticles is not damaging the cell. Checks for cell viability, proliferation and retention of multipotency must be conducted. Testing cell viability - making sure the cells are not killed outright by the addition of magnetic nanoparticles - can be assessed by an apoptosis or necrosis assay. To ascertain whether cells are still able to proliferate an MTT assay can be performed: enzymes in living cells break down the MTT molecule, forming an insoluble purple compound which can be visualised and quantified. MTT is broken down quickly by cells which are dividing, indicating a healthy, proliferating population. Finally a test to ensure stem cell multipotency is retained must be undertaken. Assaying for cellular markers unique to the stem cells is the usual method. In neural stem cells for example, nestin is highly expressed in the multipotent neural stem cells but is down-regulated in the neuronal and glial cells they differentiate into . Retention of nestin expression therefore shows that the cells have not differentiated and remain multipotent. One potential drawback with magnetic nanoparticles is the fact that they can be processed by the machinery within the cell, altering their magnetic properties [45, 47]. This can be overcome by coating the nanoparticles in compounds such as phospholipids  or short peptides  to make it harder for the cell to recognise and process the nanoparticles, increasing the length of time a signal can be detected (Figure 3). In the current situation of aging populations one of the more exciting aspects of stem cell research is the development of cures for neurodegenerative conditions since the central nervous system has only limited regeneration abilities. This also means that traditional methods of monitoring the progression of stem cell therapies such as biopsies can not be used due to the potential of further damage to the areas under repair. The non-invasive use of nanoparticles in MRI scans to track stem cells is therefore of great value in neuro-regeneration therapies. Schematic of a superparamagnetic iron oxide nanoparticle. The superparamagnetic core of the nanoparticle can be coated in a number of different components, such as peptides, to allow it to avoid being processed by the cell too quickly and so remain active for longer (left). One method to get nanoparticles into cells is by using a transfection agent such as poly-L-lysine, which can also be performed on coated nanoparticles (right). Alzheimer's disease is one of the leading causes of dementia . It arises primarily due to an accumulation of amyloid fibres in neuronal cells, resulting in the damage leading to dementia. Studies have shown in mouse models that treatment with stem cells such as bone marrow mesenchymal stem cells (MSCs) has a neuroprotective effect and can slow the progression of the disease . Parkinson's and Huntington's diseases also cause damage to neurons, with their more well-known symptoms including loss of motor control. Huntington's disease arises from a genetic defect resulting in the huntingtin protein having an extended glutamine repeat . This protein is expressed in a large number of cell types but only seems to affect medium-size spiny GABAergic neurons in the striatum, causing them to die, resulting in symptoms such as loss of motor control and dementia . Parkinson's disease has no one cause, although there is some evidence to suggest a genetic factor plays a part . The disease is characterised by a gradual loss of dopaminergic neurons, and treatment of Parkinson's disease with dopamine has seen some success , however the long term effect is not satisfactory due to the adaptation of the drug and the progress of the disease. Both of these diseases are current targets for stem cell therapies, especially Huntington's disease as there are no effective pharmaceutical treatments for it (although some drugs may lessen the symptoms somewhat ). A number of stem cell therapies for both diseases are in development, and in order to better understand these diseases and therefore optimise the development of treatments animal models are being employed to track and monitor the stem cells used. To investigate whether the neuroprotective effects of MSCs can be an effective treatment in Huntington's disease a rat model has been set up, with the MSCs labelled with Feridex for monitoring via MRI (Figure 4) . The study showed that the MSCs migrated away from the site of injection toward lesions caused by the disease and did indeed show a neuroprotective effect. Similarly in a rat model of Parkinson's disease embryonic stem cells were labelled with superparamagnetic iron oxide particles and were monitored in vivo for six months to investigate their migration and neuroprotective effects . Also, as with Huntington's disease, implanting mesenchymal stem cells to produce neurotrophic factors is being explored with the hope that they can confer neuroprotective effects for the surviving dopaminergic neurons . Nanoparticle MRI in Huntington's disease mouse model. MSCs labelled with Feridex injected into the left hemisphere of a Huntington's disease rat model. The labelled cells show up as hypointense areas on the images, indicated by arrows. Clockwise from top left the images show a cross-section of the brain, a top-down image of the rat and a side-on image of the head . While neurodegenerative diseases manifest damage over a relatively large time span, acute neurological damage occurs as a result of direct physical damage to neurons, such as in spinal cord injury. In the classic model of injury to the spinal cord, the neuronal network below the injury is essentially “cut off” from the rest of the CNS with no sensory signals able to pass “up” to the brain or motor signals “down”. Here again stem cell therapies are being considered to repair the break and restore function. A wide range of different approaches to spinal cord repair are being considered, from re-programming embryonic stem cells to over-express neurite outgrowth factors and implanting them at the injury site  to transplanting embryonic and mesenchymal stem cells into the site of injury (Figure 5) . Nanoparticle-labelled stem cells in spinal cord repair. Transplanted magnetic nanoparticle-labelled NSCs show up as a hypointense signal on the MRI of the spinal cord, indicated by an arrow . Once again a detailed knowledge of how the cells move and behave in vivo is highly desirable in order to better target and optimise the therapy. While iron oxide nanoparticles have been used in some cases to track the fate of implanted stem cells , other studies are looking into the possibility of using Cobalt (Co) nanoparticles. Cobalt nanoparticles have the potential to be even more effective as a contrast agent than iron oxide nanoparticles. Co nanoparticles have a saturation magnetisation value much higher than that of iron oxide nanoparticles at room temperature, causing them to have a bigger effect on proton relaxation and thus giving a greater MRI contrast. This greater sensitivity allows the use of nanoparticles with core sizes smaller than those in iron oxide nanoparticles [49, 55]. Co nanoparticles have a low stability, but hollow nanoparticles composed of cobalt and platinum (Pt) have been shown to be stable for several months . A study has been carried out in order to determine if these CoPt nanoparticles can be a suitable replacement for magnetic iron oxide nanoparticles in MRI scans . The first part of the study looked at the toxicity of the CoPt nanoparticles, assessing the effect CoPt nanoparticle uptake has on stem cell viability and multipotency. Cobalt itself can be toxic in solution but the CoPt nanoparticles were coated in a number of different ligands such as thiolated polyethylene glycol or short peptides; these “shells” were designed to shield the cobalt from the cell with the intention of reducing any harmful effects. To test for potential toxicity neural stem cells were incubated with varying concentrations of CoPt nanoparticles. It was found that 16μg ml-1 was the optimum concentration; incubating the cells at this concentration for 48 hours gave a high level of nanoparticle uptake while having little effect on the viability of the cells. 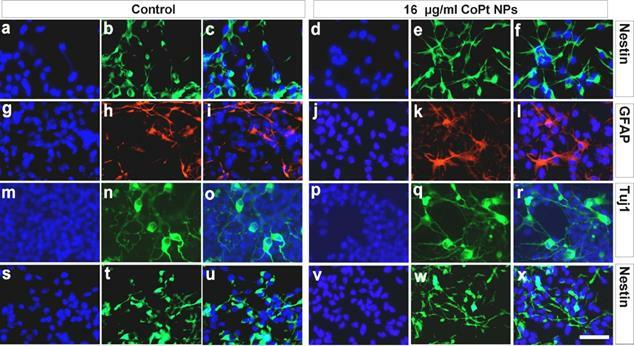 Tests for the expression of the neuronal progenitor specific marker nestin and looking at the differentiation of the cells showed that the multipotency and proliferation of the CoPt-labelled cells was unaffected (Figure 6). MRI scanning of the labelled cells showed that they gave a hypointense signal, therefore they were used in an ex vivo proof-of-concept experiment. CoPt-labelled neural stem cells were transplanted into a spinal cord slice culture. This resulted in success: MRI scans could detect the labelled cells at relatively low concentrations- around 106 cells, and the signals could still be detected 2 weeks after transplantation (Figure 7). In addition the transplanted cells maintained their multipotency, and there was evidence of neuronal differentiation. The findings suggest that CoPt nanoparticles show great promise as a more sensitive alternative to traditional magnetic iron oxide nanoparticles . As with CNS cells, the cells in cardiovascular muscle have a limited capacity for regeneration. Stem cells may offer therapies for a number of conditions in the heart. While the nature of the heart, such as its continuous movement, makes stem cell tracking via MRI more complicated, this is still a very useful method for evaluating stem cells based therapies. Therapies in development include repairing heart valve dysfunction, where autologous transplantation of bone marrow stem cells has seen some success in patients . In a cardiac infarction blood flow to myocardial tissue is cut off by a blockage such as a blood clot, causing damage to the tissue. The use of stem cells to repair this damage is being explored . Magnetic nanoparticles have been successfully used to label and track embryonic stem cell treatment in the myocardium of a mouse cardiac infarction model. Positive effects were seen with the stem cell treatment, helping restore some of the heart functions. MRI showed that the stem cells remained in the infarcted area and were helping preserve the thickness of the myocardium, as well as restoring some of the functions of the heart . Effect of CoPt nanoparticle loading on NSCs. The expression of various proteins was investigated to assess the effect of CoPt nanoparticles on NSC proliferation and multipotency. The first columns for the control and labelled cells show nucleous staining; the second columns the stains for the various proteins; the third column shows the first and second overlaid. The first row shows nestin expression levels (a-c) are unaffected after labelling with 16µg ml-1 CoPt nanoparticles (d-f), indicating that labelling does not effect multipotency. Similarly when the cells differentiate there are no differences between labelled and unlabelled cells; glial differentiation (indicated by GFAP expression, g-l) and neural differentiation (indicated by Tuj1 expression, m-r) were unaffected. Additionally after 6 days of differentiation there was still a population of nestin-expressing cells; these too were the same whether labelled or unlabelled (s-x) . MRI scan of unlabelled (left) and labelled (right) NSCs in spinal cord slices. A hypointense signal on the right-hand image shows the presence of CoPt nanoparticle-labelled NSCs in the spinal cord slices . Cancer, too, is a target for stem cell therapies. For example it has been shown that mesenchymal stem cells have the ability to “home in” on tumour cells , offering the possibility of a method to detect some cancers. This has been exploited in a mouse model by labelling mesenchymal cells with magnetic nanoparticles and injecting them into mice with gastric cancer. MRI images showed that the stem cells did indeed localise to the cancer cells, giving one detection method for this cancer . In addition the study also showed that by treating the mice with the magnetic nanoparticle-labelled cells with an alternating magnetic field for four minutes once a week for a month reduced the growth of the tumour. The alternating field caused a localised hyperthermic area around the labelled stem cells, reducing the growth rate of the cancer cells to which they were attached . The use of magnetic nanoparticles in MRI is now wide-spread in pre-clinical in vitro and in vivo stem cell investigations, and is now also making its way into the clinic. In one such study neural stem cells were used to treat brain injury. Autologous cells were collected, neural stem cells selected and labelled with Feridex and implanted into the patients. MRI imaging was initially used to detect the initial distribution of cells with some success. Additionally scans taken several weeks subsequently seemed to show the labelled stem cells had migrated towards the site of injury (Figure 8) . Autologous bone marrow stem cells have also been used in treating spinal cord injury . 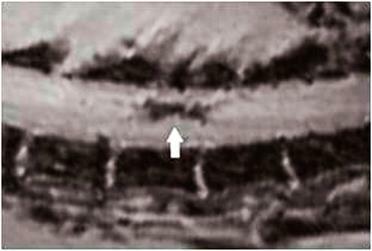 The stem cells were labelled with magnetic nanoparticles and injected into the site of injury via a lumbar puncture. 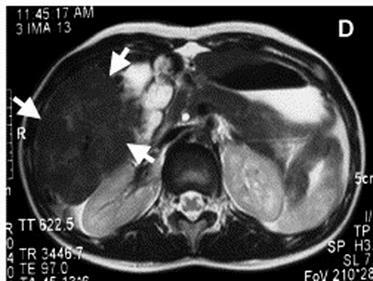 MRI scanning over several weeks showed that the stem cells had migrated to the site of the lesion. 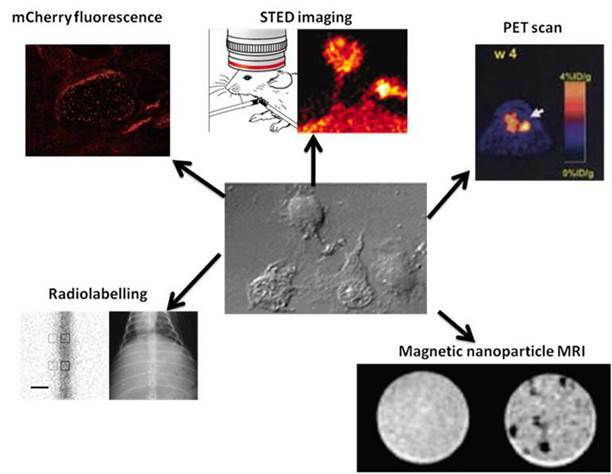 The advantages of nanoparticle MRI over other tracking methods are numerous: it allows high-resolution, non-invasive investigation into the effectiveness of stem cell therapies. However, it does have some drawbacks. For example it is not possible to distinguish between live and dead cells. A study on labelled cells transplanted into the heart showed that an MRI signal was detected for the transplanted cells 2 weeks after transplantation, even though the cells were shown to have been dead for most of that time . Also dead cells may be phagocytosed - especially if the transplantation area undergoing an inflammatory response - transferring the nanoparticles and therefore the signal to the phagocytosing cell . This effect could however be reduced with the use of autologous stem cells which are less likely to provoke an immune response and become phagocytosed. Another potential problem is the fact that nanoparticles are degraded over time and the signal may be lost after around a month, depending on the type and concentration of nanoparticle. Again steps are being taken to combat this, with additions such as phospholipids making it harder for the cellular machinery to get at and degrade the nanoparticles . Finally, in rapidly dividing cells, dilution of the nanoparticles can occur with cell division spreading the nanoparticles between the daughter cells, leading to a gradual decrease of the MRI signal , although this is addressed somewhat with Co nanoparticles as they give a stronger signal at lower concentrations . Even in slowly dividing cells, though, asymmetrical division can result in one daughter cell containing more of the nanoparticles, making the loss of MR signal less gradual than would be the case with symmetrically dividing cells [38, 65]. Injection of labelled stem cells into patient with brain trauma. The MRI images show the brain before (left) and after (right) the administration of stem cells. The asterisk indicates the injection site of the cells. 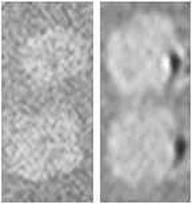 The image on the left shows no hypointense signal before the labelled cells are injected while the right-hand image shows a relatively large hypointense region where the labelled cells are located . The need to understand the fates of stem cells used in therapies is clear. The cells must end up in a position where they can provide the maximum benefit to a patient while doing as little harm as possible. The use of nanoparticle MRI offers a high resolution, non-invasive way to track grafted stem cells, allowing researchers to determine the best way to proceed in developing treatments and not putting the patient through any unnecessary discomfort. Some of the drawbacks to using nanoparticles are being addressed, and their use can only increase and improve as a new generation of magnetic nanoparticles is being developed and more therapies enter the clinic.